Lionel Messi banged in a hattrick against Deportivo La Coruna on Sunday to help Barcelona clinch their 25th La Liga title. The five-time Ballon D’Or winner also took his tally to 32 goals in the league, one ahead of second-placed Mohamed Salah of Liverpool in the race for the Golden Shoe. 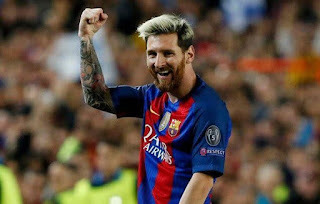 Perhaps a lesser-known record is that the 30-year-old Argentine is now the only player to have scored 30 or more La Liga goals for seven seasons. Since hitting 30 goals for the first time in the 2009-10 season, he has also done so in the 2010-11, 2011-12 and 2012-13 seasons. Although he seemed to take his foot off the pedal in the 2013-14 season, he got back to his La Liga goalscoring best in the 2014-15, 2015-16 and now 2017-18 seasons.